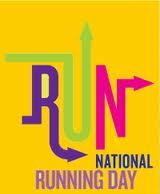 I'm sure most of you have heard the news by now...today is National Running Day. IF when Jason got up for swim and I woke up and my legs felt ok after yesterday's leg workout. IF when Jason got up for swim and I woke up and couldn't go back to sleep OR I happened to wake back up as the sun started coming up around 5:45. So that's not exactly what happened. What ended up happening was that I heard Jason get up at what I assumed was 5 am. Then Jason got back into bed. I got up to potty and took note of how my legs felt. They felt ok, but I got back into bed to see just how sleepy I really was. Then Jason's alarm actually went off...at 5:20. He apparently reset it. I was wide awake, but it was still really dark. So I just wallowed for a few minutes then knew that was futile. I couldn't go back to sleep for 45 minutes. So no excuses. I was going to celebrate National Running Day. Since I did run both Monday and Tuesday, the plan was not for a long run. Just 2 miles and that was it. I started off feeling pretty good right away. It was cooler with lower humidity (always helps). Maybe because I knew it was a shorter distance, I don't know things clicked. I just had some pep in my step. The moon was super bright even as the sun was starting to come up. Just a gorgeous morning. Calm and peaceful, just one of the reasons I love running. I really had to stop myself from taking the longer route, which would have put me at 3+ miles. But the point today was just to celebrate the day. It wasn't about racking up miles. It was about remembering why I love running and what it means to me. Mile 1 was 9:15 and mile 2 was 8:30. Done and done. My original workout plan was to hit the gym at lunch for back and triceps. So, it ended up being another double workout day because of the unplanned (but sort of planned) run. I did 15 minutes on the elliptical then had to rush over to secure a bench as it got insanely crowded with obvious hotel guests (very cocky looking group of guys that I saw last week. They are definitely not members, but likely guests of La Quinta Inn). I also added in 3 sets of 10 reps of low-back extensions on the stability ball. I really felt kind of weak today, mostly for triceps. I think it's because the 2-a-day workouts this week are catching up to me. Tonight I should have grilled out, however, I was feeling really lazy. I love grilling. But, the grill is on the patio and it means going up and down some back stairs, trying to avoid tripping over the dogs or stepping in dog poop along the way. So, I ended up roasting the veggies for tonight's dish. I had a more complicated dish planned out, but ended up making it easier on myself for more of a one-pot type of dish (though I certainly used more than one pot. My mom has a nice vegetable garden and her green beans are coming on strong. So, she sent up a bag of them with my sister on Saturday. They needed to be used up and so did the portobello mushrooms I had on hand. I put together a simple, roasted veggies and quinoa dish. I roasted up the portobellos with yellow and orange bell peppers and red onion. Meanwhile, I cooked up quinoa and steamed the beans. I mixed everything together in a large bowl adding in sundried tomatoes, cannellini beans, powdered garlic, salt, pepper, thyme, parsley, a splash of red wine and balsamic vinegars and some nutritional yeast flakes. I probably steamed the beans just a hair longer than I had intended so they weren't as vibrant. But overall? Not a bad dish for a Wednesday night.